All transactions are safe and secure with a reliable history in online purchasing behind each of our associates. Buy the Pac-Man Teenage Mutant Ninja Turtles t-shirt to own TMNT clothing and merchandise. This funny Pac-Man inspired design features the Turtles as ghosts from the video game. 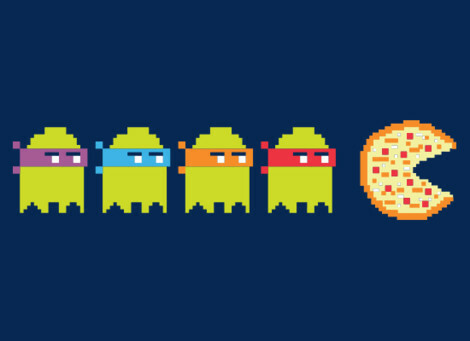 The Pac-Man Teenage Mutant Ninja Turtles t-shirt displays the four pizza-loving brothers chasing after their favorite food, pizza. As Michelangelo and the gang consume their guilty pleasure, we imagine it will give them the energy they need to take on foes like Bebop, Rocksteady, Shredder and Krang. Pair it with a Turtle Power t-shirt to let everyone know that pizza means power. Our TMNT clothing is a great tribute to the lean green fearsome fighting team. This includes the Krang t-shirt. The Teenage Mutant Ninja Turtles action figures will not disappoint either. In addition to the Pac-Man Teenage Mutant Ninja Turtles tee above, browse the TMNT Clothing Gallery for more apparel like men's and women's clothes, kids shirts or hoodies.